Established in the year 2000, The Living Waters Child Sponsorship Project was set up by City Faith Ministries Trust to empower children from poor countries all over the world especially in the developing countries. 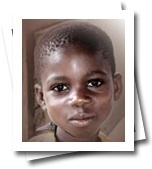 The Living Waters Child Sponsorship project is an initiative to support the education, healthcare and general welfare of children from poor countries. It is designed to not only benefit the sponsored child, but also the entire family and community in which the child lives. The project currently focuses on children in Ghana and India but as the number of sponsors increase, it will be extended to other nations where such assistance would be beneficial. Children are chosen on a basis of need. For example, a child may be chosen from a family where neither or only one parent is working or where the family is made up of several young children. How will the money be allocated? The money is allocated towards the children’s education expenses. The sponsorship program will continue for as long as the sponsor wishes or until the child reaches the age of 19. When the child reaches this age the sponsor will be contacted to confirm whether they would like to continue sponsoring the child or change to sponsor another child. If you are interested in getting involved in our Child Sponsorship Program or require more information, email missions@clfi.org, call 020 8858 6482, visit www.clmi.org.uk or visit www.aheartformissions.co.uk.